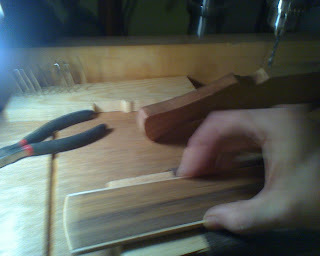 The last thing to do to the fretboard before putting the frets wire on is to radius the top. This is done mostly for comfort of barring chords and is common among steal string guitars but not classical (not sure why). 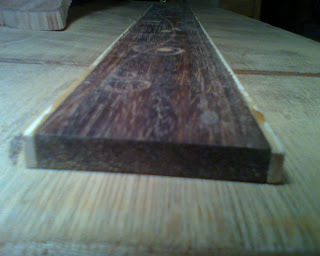 Below is a photo of the flat fingerboard (the camera lens added a slight bend but it is indeed flat). 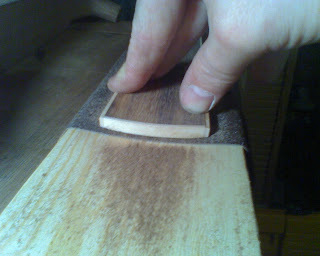 If you remember the radiused sanding block from a previous blog post... well here it is in action below. A note on sandpaper: There is the regular stuff that I had always purchased that is well under a dollar per sheet. And there is a more expensive, cloth variety that is almost two bucks a sheet... The cloth is worth every penny – cuts better and for a MUCH longer period of time... as a matter of fact when I was done sanding, this the sheet seemed to be as good as new. Notice the curve? That was after a lot of sanding. I had to clean up piles of sawdust about 5 time during this process. Started with 80 grit then 120 and finished with 220. 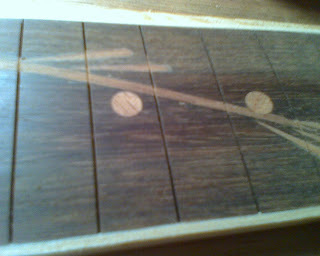 I will polish the whole thing with steel wool after the frets are installed. 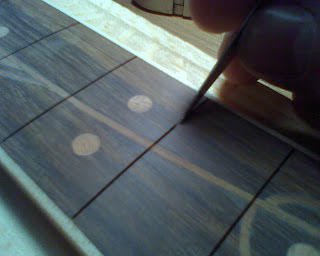 Also the ebony wood will become darker once exposed to the light. Notice the difference in color between this photo and the top photo. Cleaning dust out of the kerf with an Exacto. 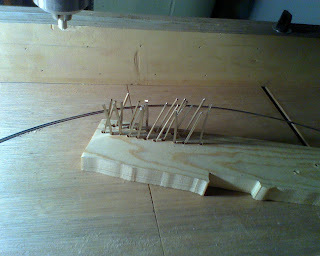 I was ready to install the fret wire but my wire snips that I ground flush (the post prior) didn't work! I don't know if I allowed the tip to get too hot (I don't think so because I quenched often) or if I ground down too thin... I did try grinding the tang off the edges of the fretwire with a Dremel, but I didn't like the results of that approach either. But regardless it's back to the drawing board to find a solution. The tool Stewart Mac sells is $30 – but I'm hoping to find a much cheaper solution at the hardware store tonight.